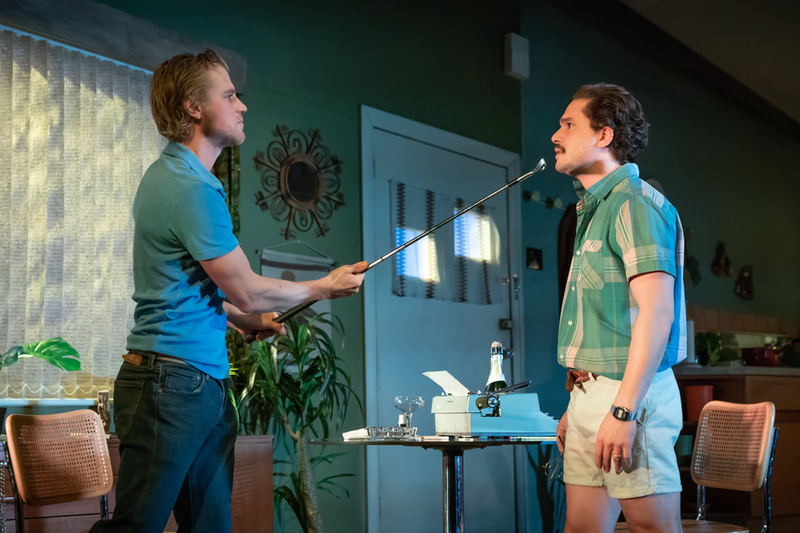 Sam Shepard's play True West — a drama of sibling rivalry — is for large chunks a two-hander that Kit Harington and Johnny Flynn clearly revel in. Unlike other family dramas by the likes of O'Neill, Miller or even Karam's Humans, where hierarchies feel fixed long before the time of the play, this one let's the power dynamic swing to and fro — something that sets up some very entertaining moments. At the start Austin (Kit Harington) is the one in charge. He has the job, family, a sure sense of self, a car and carefully crafted moustache. His cosy writer's vacation is interrupted by his brother Lee (Johnny Flynn) following a five year absence and whose life is the polar opposite: rootless, thief, thin-skinned. Each seems to want what the other has, or at least what each represents to the other. Lee would like Austin's success; Austin, Lee's freedom to roam. The reversal of fortune that follows, where the art of story-telling itself becomes the battle-ground between the brothers, is both meta and fun. However, emotionally it falls a bit flat. Lee's anger towards his brother is a bit one-note and seems barely warranted. Austin's reversal into would-be outlaw is a bit neat and not credible. The sudden appearance of their mother seems to serve no other purpose than to trigger the denouement rather than illuminate relationships. Still, the play has a great energy and the pace and the commitment of the performances ensures a good evening.